To draw graffiti for everyone. It does not have to be a professional artist. The novice rider should first practice sketches on paper. 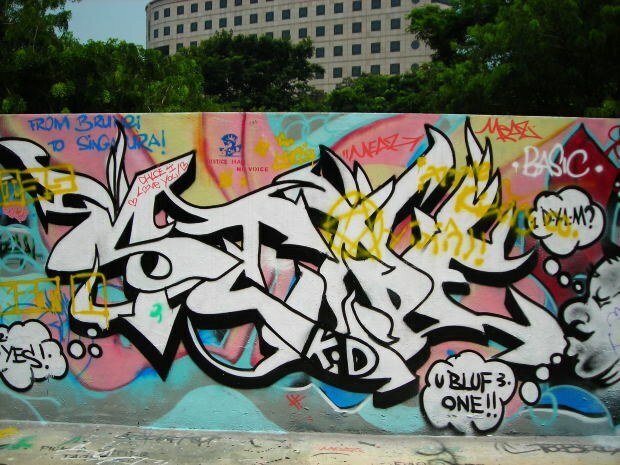 Then you need to equip yourself, choose your paint and begin to search for a suitable wall for your graffiti. A more detailed description of the rules and techniques for creating graffiti you can find below. You are going to paint graffiti. First you need to make a sketch is called a sketch. To draw beautiful and accurate sketch - not an easy task. Although at first glance it may seem that it is not. If you are doing only first steps in graffiti, you need to practice to make sketches, sketches. Take a piece of paper, pencils, fit and gel pens, markers and practice, fill-in-hand. Preference is given to thick paper. For these purposes, is quite suitable drawing paper. Take your time. Take a pencil and start to apply light strokes. Then you can correct the flaws. Then draw around it with a felt pen all painted. Eraser erase unnecessary pencil strokes. Paint the background and fill in all the color. If you like your result and you sure don't want anything else to change it, then you can transfer the sketch onto the wall. Now, prepare your equipment. Need to choose paint. You also need to take gloves and a respirator. Paint fumes are poisonous, they can be poisonous. Your clothing also needs to be able to be covered in paint. Now you need to choose a suitable wall. The most appropriate option for you will be porous concrete or any primed surface. You can also paint on a metal surface, but you need to degrease. Try to paint in places that are designated for graffiti. Don't draw on top of the other. Select or inconspicuous wall. If the wall in front of you, completely painted, but it seems quite appropriate for your first creation. Try covers your balloon painting, and whether it is visible. Not all colors, especially bright, can overlap other labels the first time. It is extremely difficult to overlap the black paint. When you have the wall try to sketch a sketch a cylinder in the air. Graffiti, first and foremost, you need to take care of the background. First displayed at the sketch. This is done color the main background. Even if you make a mistake, you will be able to fix it. You should not stop the drips with a rag, otherwise you get streaks. Better wait until the paint dries. Fill them in later with the background color. Do not rush to direct the spray in a concentrated area of graffiti. First check whether the installed cap. Test it, having scattered on the ground. In the rain and cold weather the paint may be hard to go, and will be dry for long. It is best to choose warm weather. The wind can also be a hindrance to drawing. Stock up on caps, even professional riders, they are quickly clogged, bring extra. Before you replace the cap, invert the container and tap. Let the paint out. 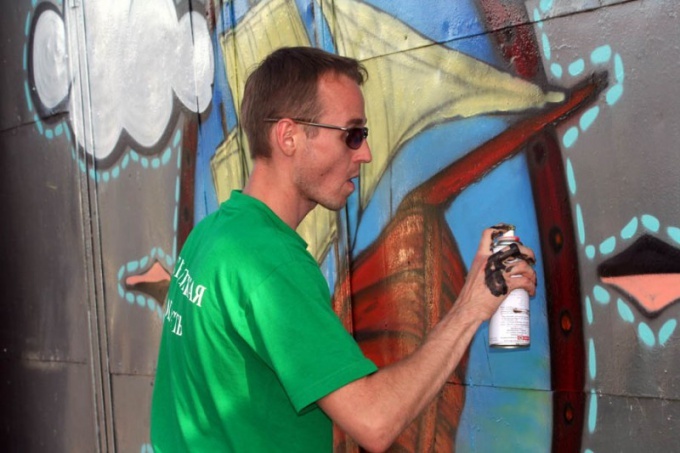 Today many people dream to master the intricate art of street painting graffiti. However, before you take to the streets with spray paint, you need to master the technique of drawing in a more simple variant – at least with a simple pencil and paper. Before you begin to draw yourself, observe those who are already good at drawing graffiti. Note what methods they use to create graphic effects in their drawings why they are drawing what is in each element of the graffiti. Take a sketch pad with quality paper and a good soft pencil, eraser, markers, and colored pencils, if you want to paint the final image. You can try to copy ready graffiti other artists – during the training, it helps to improve technique, and can come up with their own drawings. Do not try to draw three-dimensional drawings in 3D start with a simple two-dimensional images. For early train to draw in graffiti-style different letters and numbers. Hone your ability to draw in graffiti any letter of the Russian and the English alphabet. 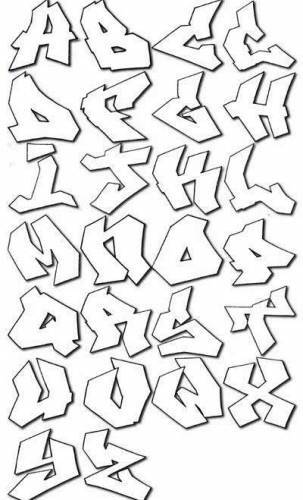 The easiest way to learn to make graffiti-style letters of the alphabet on the example of his own name. Draw a letter, making between them a small distance – free space will give more opportunity for further detailing of each letter. When drawing letters, press the pencil on the paper with different strength, – that you will achieve more variety of texture pattern and its depth. The necessary elements of drawing shade and stahujte – this will lead you to understanding the three-dimensional image. Basic style image bulk items in graffiti – style bubble. In order to achieve the effect of the bubble letter outline well-defined, rounded outline, gradually leading the line and not making corners. After the contour is created, the eraser erase the letter inside the outline. Add a different color, trace the outline with a thick marker, highlight the features of letters with additional strokes. Experiment and soon you will begin to acquire the necessary technical skills in drawing. We will also tell you how to learn to draw with a pencil. You'll also learn how to draw real graffiti. 2. Thus, the primary shapes are the circle, square and triangle, the rest of the pieces usually are their derivatives. Try to draw on the sheet of these figures. Practice their first drawing in two dimensions, then in three dimensions (including facets). Now you can share graffiti into two parts — those who are really pleasing to the eye, that is originally drawn on paper with exact colors, and those which are drawn at random, just so (to be honest, I don't know what to draw). 3. Before starting to draw with a pencil, you need to invent a tag - a nickname a writer and learn to write beautifully. 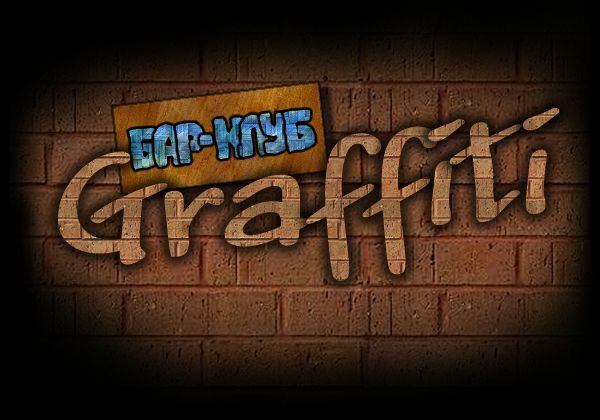 Graffiti – the art of the modern towns of culture, and more and more teenagers and young people are involved in this art, wanting to learn all the intricacies of graffitiin order to paint urban objects and buildings. Before moving on to the difficult technique of painting with spray paint, you should learn how to draw graffiti markers. In the future, markers will help you even when you gain some skill and become a professional – markers can be applied to the image fine details and put tags. Purchase quality markers with a flat end that will not be washed away from painted surfaces in the rain. Do not draw graffiti too cold and windy weather – it makes the process of painting and applying the paint more difficult. Select the suitable style of drawing. For example, if you are going to draw in Bubble Style, learn how to draw a marker shape in the form of bubbles. Drawing in this style consists of thick lines, which are interwoven with each other, creating a three-dimensional image. Also you can learn how to draw Wild Style is one of the most difficult styles because it differs the chaotic interplay of a large number of lines that are spontaneous and disordered. Create beautiful drawings in this style very difficult. Before you start painting, prepare the background, which will simplify the work and apply a Prime coating the surface of the picture. Cover the surface with water-dispersion paint or enamel, and then apply to the wall the sketch, dragging its main outline thin lines. Then draw the outline more confidently and clearly. Then draw the inner filling of your drawing, and then move on to the final edging. Improvise in the process of drawing – the figure may change, your sketch is not static, and final. Connect the imagination and create original graffiti, and then finish drawing the final touches, modify the piping, make the color more saturated and bright, add more details to the drawing. If the paint drip – wait until it dries, and paint over it. How to learn to draw graffiti? While walking around the city can be found on fences, walls of houses, passages vivid and, at first glance, not very clear drawings. How to learn to draw graffiti for beginners? In Russia this kind of art began to gain popularity in the mid-90s, when breakdancing, which was an echo of hip-hop, and hippie culture. Many people wonder how to learn to draw, to draw to drawn the soul cling. And to say how beautifully you draw. In our subjective opinion, learn to draw beautifully only possible if you do it right. You need to learn to draw graffiti? First and foremost, you will need colored pens, markers, pencil and eraser. Don't listen to those who say that to learn how to draw graffiti is almost impossible. All our best, it would wish! Start basic terms will help you in the future. The bombing – fast drawing graffiti. 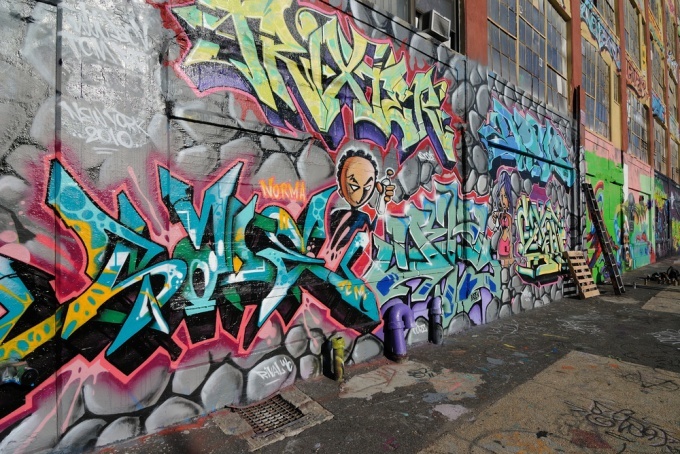 In 10-15 minutes you draw graffiti of two or three colors, mostly chrome or silver. This graffiti is suitable for walls, most often for trains. Stensil stencil that you paint the house, and then a few minutes to draw it on the surface. The Bank is the container with your paint. A tag is your nickname for graffiti. Sketch – a small sketch graffiti on paper. Before you start to draw don't forget to come up with a nickname, so then to sign their drawings. To start drawing the most simple graffiti review to start professional work. Despite such work, remember some items, do it on paper sketches. And then connect the sketches and their imagination in their work. Lot of practice, it will help you master the basic technique of graffiti. No need to go right to the wall and start painting. Learn many basic techniques on paper. Later learn how to apply shadow and volume to the drawing. Sign up, if possible, for drawing lessons with a good teacher. Here you will learn to feel the volume and depth of the depicted object. Remember that you are a beginner and do not try to take the high bar. Everything comes with time. Chat with graffitistami with experience, they will give you good advice. After a long practice, you will understand that it is already possible to go on the street to any surface. When you understand this, go to the store for spray cans. Buy you need the cylinders and go, for example, to the wall. Always remember about security, you can always catch this illegal business. Already on the wall to set forth the main lines to make it easier to navigate in the figure. Draw smooth and neat lines, do not pull hand. But at the same time draw a coherent line quickly, you'll ruin the paint. All the lines draw without lifting a hand. Discontinuous lines look ugly. Draw your picture back up to see what happened. If you need something to correct, do it. Don't forget to sign your drawing, put the tag. Can also write another smart and beautiful phrase. That's all! Your first graffiti ready! Rather run away from this place, that you are not caught by the hand. 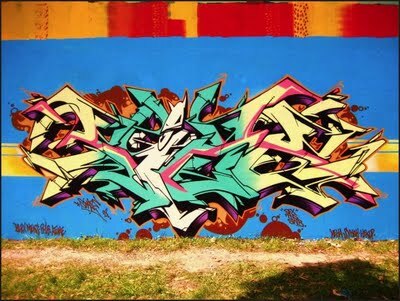 "Wild graffiti"or graffiti in a wild style – direction, which is most often used for painting walls in almost all cities. The main feature of this kind of graffiti is an unusual form and the interweaving of the letters represented a variety of bright colors. respirator, gloves, cap, airbrush, spray paint. In order to learn how to draw any type of graffiti, you should first try your hand on paper and then go to work on the street. Therefore, the first step in learning wild style will be sketching. Think about what you would like to draw. 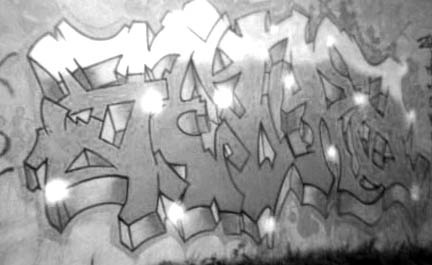 Master "wild graffiti" usually write different words. It can be your own name or nickname, the name of your favorite band or some kind of short slogan or motto. There are many fonts graffiti, so once you decide on the word that will draw, choose the most suitable technique of images of letters. See examples on websites or simply on the walls of your city. You can also try to develop your own style, which will differ from all the others, but don't forget that the font needs to match the name of the style to be "wild, bright, explosive. Once you are happy with the font and theme of your drawing, start to practice. Sketching better on A4 sheets, so they are more intuitive and effective. The first sketches it is recommended to do a pencil so it was easy to correct mistakes and to correct drawing. Experiment on your image, try to make him bulky and add a lot of additional parts, such as arrows and sharp corners. So many drawings in a wild style so complex and confusing that to read them is almost impossible, but that they become more original and interesting. After a sketch in pencil, trace all the contours gel or ballpoint pen, and then fill in the letters with bright colors. 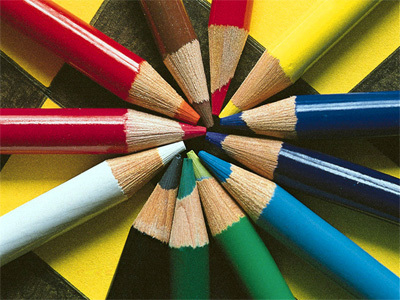 You can draw anything you want - colored pencils, markers or crayons. Now add the background and if your drawing you like, try to draw it on the wall. Don't forget that painting the walls in public places in our country is a crime, so better to find some secluded area and practice there. Before you draw on the wall, appreciate your chosen place, and estimate where and how is your figure, and consider what equipment and materials you will need. If your chosen wall is porous, the pre-purchase primer, otherwise the paint will be instantly absorbed and will have to repaint. Think about whether you need a ladder and additional lighting. Be sure to purchase a respirator and gloves to protect yourself from the particles sprayed from the spray paint. You may also need a few different caps (a cap is the nozzle on the spray, which depends on the thickness of the depicted line), airbrush and spray paint. If it is not possible to buy everything you need in hardware or specialized shops of your city, try, use the Internet and order what you need. Each of us saw on the walls of his city, colorful labels that create street artists – writers. Become one of them is not a problem, the main thing - the desire to learn how to draw and lack of fear of law, as the painting on the houses and fences is prohibited. Create your own unique style. The only way you can stand out from a large mass of street artists. In this case welcome an extraordinary imagination, sense of style and fresh ideas. Learn how to mix paint and create original drawings. Don't forget to also come up with your signature that will show off your works. Use trafarety. They are useful if you are just learning to draw. Stencils will help to maintain clear lines and create a beautiful composition that will challenge the admiration of all passers-by. Manufacture improvised patterns out of any material, but it is best to use cardboard in which you cut the desired letter or image. The stencil will cover part of the wall on which the paint should not go. Use an aerosol spray paint. When you click on them the paint starts to spray out and the writer can draw. At first it seems that the cartridges are not too comfortable for this kind of art, as a wide spray of paint does not achieve clear lines of the drawing. But you need time to understand the specifics of creating graffiti. Some writers to create images using markers, which are sold in specialized stores. Practice to draw on plain paper. Before you can create another masterpiece on the wall, you should learn how to create illustrations on paper with ordinary pencil. And only after that the final image should be paint markers and transfer it to the walls of the houses of the city. Purchase a respirator to protect your Airways from the noxious fumes of paint. You will also need a ladder and lighting, if you will draw in the dark. Buy a solvent that will help to degrease the surface on which the image will be created. So figure it would be better to go longer and survive. Be aware of security. Create your own masterpieces, where you get scolded for ruining the walls of houses or private fences. Better as a canvas to choose concrete slabs, which enclose the construction site or abandoned building. Not to paint private property. The most important enemies of writers are the police, janitors, grandmothers and stray dogs. Outline. To make it easier to draw, you first need to identify the main outlines on the wall. Draw lines without lifting their hands. They should be smooth and neat. During the creation of the graffiti put on your gloves and old clothes that it was not a pity to stain. Since your outdoor work of art can paint, better take a picture of it to commemorate his writings. Do not paint in windy and cold weather, as the paint will go smoothly, and will quickly freeze. The art of graffiti has quickly found its fans. Learn to draw gradually, observing existing work and developing their own style. Start to learn drawing graffiti best with text. 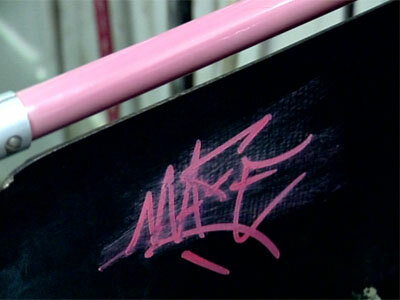 Beginners could be encouraged to write graffiti your name. A simple pencil, eraser, paper, pen, markers, spray paints. Consider the version of his name you want to write, if your name has a short and a long form. Decide what font it is better to write your name. In graffiti there are a variety of fonts: a classic more rounded, angular, deliberately difficult to read, print, cursive, uppercase. The choice of fonts is not limited to existing options. It's much more fun to invent your own font which will be your individual style. Come up with your style at once is very difficult. 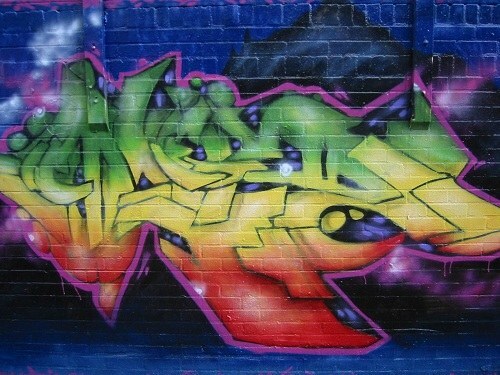 Beginners can focus on the already established works of other graffiti artists. Select the most similar fonts. Try to imagine how will look your name written in them. Decide which font will fit more. Further, when writing the name, you could copy or slightly modify. Take a sheet of paper (preferably A4 size) and a pencil. Start to draw your name in selected font, light touches, removing flaws using the eraser. Take your time, get the best result. Play around a bit with the font, make the letters more round, or, conversely, angular, change the size of the letters and their individual elements. Pay special attention to the connection of the letters or the transition from one letter to another. Use your imagination, and then an inscription get creative. Each time you will get better, after all, to learn how to write in graffiti practice is very important. When the pencil sketch is ready, trace it with a pen and erase with an eraser pencil strokes. Choose the color that your name looks good. Colors should harmonize in scale. Let's say you want to make a smooth transition from one color to color the first letter, to another, which will be the last sign. Then it is especially important to choose basic colors are the same intensity and lighter for transport. You will be spraying each other. To think about colors is very important. If you have an intricate font, do not overload the inscription complex color combinations. A simple font will only benefit from bright, creative coloring. Paint the name conceived by the markers. When the desired sketch on the paper, transfer it to a concrete wall. Choose a wall with a slightly rough surface, reduce paint runs. Graffiti in our time are becoming increasingly popular. The attitude to this art is ambiguous: some people even consider him a mischief and vandalism, because graffiti is often painted on the fences and walls. However, it cannot be denied that among writers there is a recognized geniuses who create these masterpieces. Look carefully at other people's graffiti, learn them. To observe does not mean to copy someone else's ideas. You just have to learn from more experienced writers and not to make mistakes newcomers. Remember as successful, and unsuccessful work to make it easier for them to create something of their own. Start with pencil and paper. The most common mistake of novice writers is the desire as soon as possible to come up with something on the building that all have seen and appreciated his work. However, in most cases, beginners only spoil the walls poor quality drawings. Stock up on album leaves, pencils, erasers and markers and practice as much as possible. First try to copy some of the most simple works of professional writers. Start with two-dimensional images, and then go to volume. Use different colors and shades, so the image was more vivid and impressive: even the plain and simple color pattern often looks more beautiful sophisticated black-and-white. Learn to draw the letters. The easiest style that can be mastered by a beginner, is style bubble. The illustrations in this style are round and resemble bubbles. Just draw on a sheet of paper big printed letter, and then try to modify it, removing the angles and giving the picture a rounded shape. First, draw individual letters, and then try to write something in graffiti. Try to write your name. Many beginners is the name or nickname is used to create a tag – a unique signature of the writer. Practice until then, until you learn to draw a tag easily and without errors. When you learn how to create color drawings, try to draw more black-and-white. Experiment with pressure, shading, line thickness. Volume black-and-white drawings don't happen overnight, so practice as much as possible. Learning to draw well with a pencil, marker and paint, hit the streets of the city. It is not necessary to improvise until you're confident: draw on paper first and then transfer the pattern on the wall.